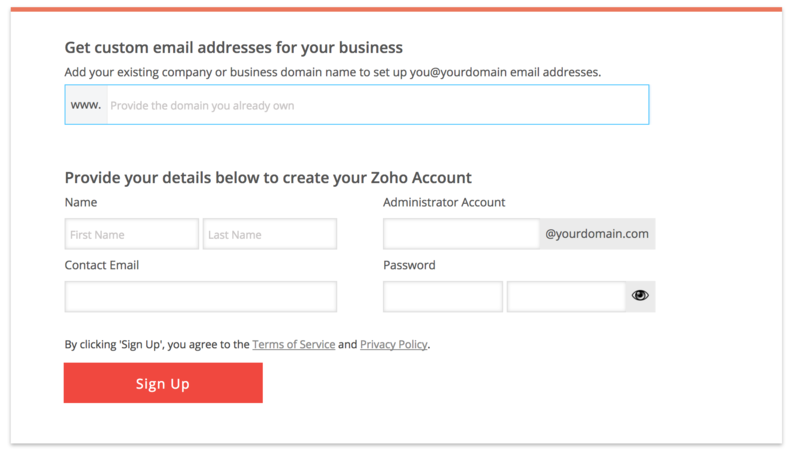 Learn how to set-up an email address with our own domain - FREE! Email is another essential part in being professional, it looks better to choose an email like @yourdomain.com rather than @gmail.comor hotmail.com. There are several options when you want to use your domain for email. A great FREE option is Zoho. Below, we'll explain how to set this up. 1. First, sign up at Zoho. European customers can sign up with this link: https://www.zoho.eu/workplace/pricing.html. Customers from other countries can sign up with this link: https://www.zoho.com/workplace/pricing.html. 2. Select your (FREE) plan and click Sign Up. 3. Fill in the form. Use your current email for 'Contact Email'. 4. You may be asked to verify your phone number. 5. Finally, you will be asked to verify that you are indeed the owner of the domain. PLEASE NOTE: If you have set up your domain with Cloudflare, you need to use the Cloudflare DNS for the setps below (and not Obior's) to enter the CNAME and MX records. You are now provided with instructions on how to verify your domain with the CNAME method. To do this, login to Obior. Go to Settings > Domain Settings > DNS Settings. Go back to ZOHO. You need to wait at least half an hour and then click Proceed to CNAME Verification. You should see a pop-up that confirms the CNAME records are set up correctly. You first get a congratulatory message and are invited to create users. Choose your basic email address, e.g. info@yourdomain.com. 7. Create groups (optional) or skip this step. 8. Next click Configure Email Delivery. In this step you have to add MX records to Obior. MX records are used for email delivery. Click 'Choose' and select 'Others'. 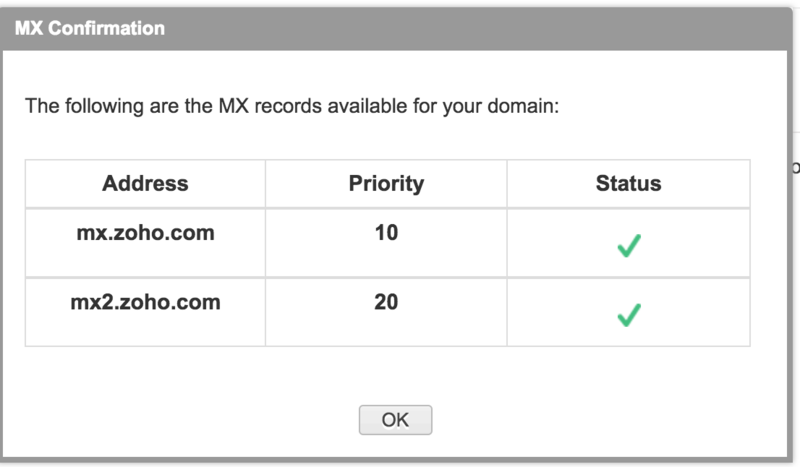 You are now provided with instructions on how to add your domain's MX records with the CNAME method. To do this, login to Obior. Go to Settings > Domain Settings > DNS Settings. Leave the TTL at 3600. Select MX as the Record type. Enter the lowest priority, followed by a space and the address on one line. Click Enter. Enter the second lowest priority on the next line, followed by a space and the address. Repeat if Zoho gives you more than two MX records. Go back to Zoho and click MX lookup. To add a SPF record, go back to Obior, to Settings > Domain Settings > DNS Settings and click Add. Enter a selector name, for example Email. Go to the DNS panel in Obior. Click Add the create a new record. In the name field, type the value until the dot behind domain key. Select TXT as record type. In the Value field paste the TXT value. Make sure to put it between brackets. 10. Zoho now gives you options to migrate your email, information about how to setup email on your phone and provide you with info about their email apps. Just follow the steps, email configuration is now complete!